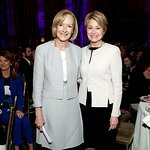 Jane Pauley has been a TV anchor and journalist since 1975. She is a Board member of Paul Simon's Children's Health Fund. In September 2009, Pauley lent her name to the Jane Pauley Community Health Center, a facility in collaboration between the Community Health Network and the Metropolitan School District of Warren Township, Indiana. The center serves the local community, including students and their families, regardless of insurance or income, with an emphasis on integrating medical, dental and behaviorial health. Pauley, who was diagnosed with bipolar disorder in 2001, insisted that the center address all aspects of wellness. She has been on the Board of Directors of The Mind Trust since 2009. She is AARP’s Ambassador of “Your Life Calling,” reporting on how people age 50+ are reinventing the way they live and work. She serves on the McGovern Institute for Brain Research at MIT leadership board. Google trends for "Jane Pauley"
We don't have any videos related to Jane Pauley.